CT-Pipe electrodes have already been widely used alongside with spreading wire electric discharge machines for start hole drilling in such machines, as well as for part processing in fine hole drilling machines. Excellent straightness is strictly checked using our original inspection methods. Holes on both ends are free from burrs, corrosion, etc. Electrode specifications (inner and outer diameters) are set in advance based on processing performance test. We manufacture and sell products with low variation due to our thorough quality control. 1) Copper pipe electrodes with slits are developed for fine hole machining. This rotating electrode can drill holes without leaving internal core. Stable deep hole drilling with low variation in hole diameter is possible. 2. The processing performance of Cu & Bs pipe electrodes differs significantly even in the same processing conditions depending on size and variation of the inner diameter. 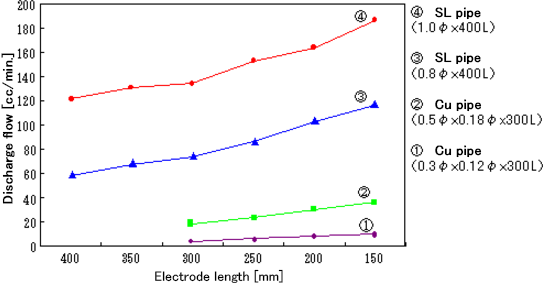 1) Results of comparative tests of Cu pipes of 0.5φ × 300L show that electrodes with the inner diameter size of 0.18φ have machining speed 3.2 times higher and half or less electrode consumption rate compared to electrodes of 0.20φ. 2) While processing performance naturally depends on power source, electrical conditions, difference in working liquid, hydraulic pressure and other factors related to fine hole drilling machine, our many years of accumulated experience and technologies allow us to manufacture and sell products with optimal specification. 3) We offer high quality CT pipe electrodes with excellent straightness and with a motto of maximum speed and low wear rate. 1) The discharge flow rate decreases proportionally as the electrode gets longer. The slope does not change depending on the hydraulic pressure. 2) Since the flow rate of liquid discharged from the pipe electrode is an important factor to ensure stable processing, the standard electrode lengths are set to 300 mm and 400 mm. 3) Long size electrodes of 500 mm length or longer are also available for drilling ultra deep holes. If reclamping is performed during drilling, flow correction and measures against deflection are possible, improving stability of the drilling. Please contact us for dimensions and shapes not mentioned in the product list. Characteristics Copper pipe electrodes with slits are developed for fine hole machining. This rotating electrode can drill stable deep holes without leaving internal core. Characteristics Due to their excellent electrical conductivity, copper (Cu) pipes are suitable for applications requiring processing speed. Characteristics Brass (Bs) pipes are superior in strength compared to Cu, and are characterized by lower electrode consumption during processing.